This year, June is bloomin’…just blooming, actually. Despite the RUBBISH weather this month, I mean ‘blooming’ in the floral rather than the exasperated sense. The garden is off to a bit of a slow start, but there are already some rather special flowers there this season, of which more in a forthcoming post. In the woods and pastures, meanwhile, the wild flowers make this perhaps the prettiest time of the year. In a month all will be uniform green. Just now, the green is dusted with white and gold, purple and blue, in a careless scattering of beauty. It occurred to me that you might like to see some of the common wild flowers here that contribute to this lovely effect. 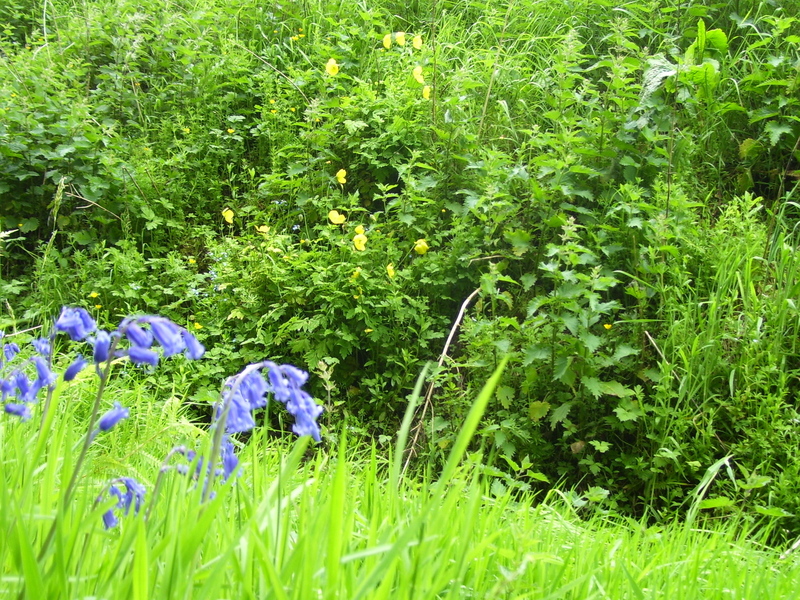 By the steep banks of a burn, late bluebells are still flowering opposite a clump of fragile yellow poppies. Tall campion stands further up the bank, amidst other flowers and grasses. 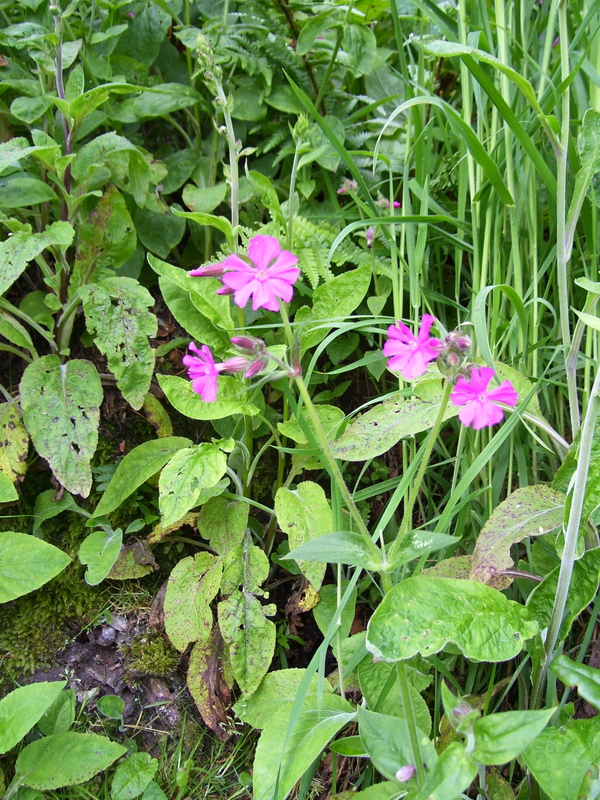 It is called red campion, but is actually that purplish pink so common to British wild flowers. This is one of the first flower names I learned as a child. I’ve always liked the flower, both for the meticulously cut petals and for the name, which sounds Elizabethan to me. I suppose it makes me think of Thomas Campion, the Elizabethan lyric poet and composer of lute music. 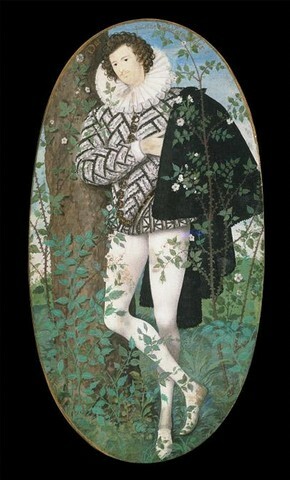 In my mind the man and the flower have intermingled so that I imagine the poet surrounded by flowers, like the unknown young man in the famous miniature by Nicholas Hilliard. 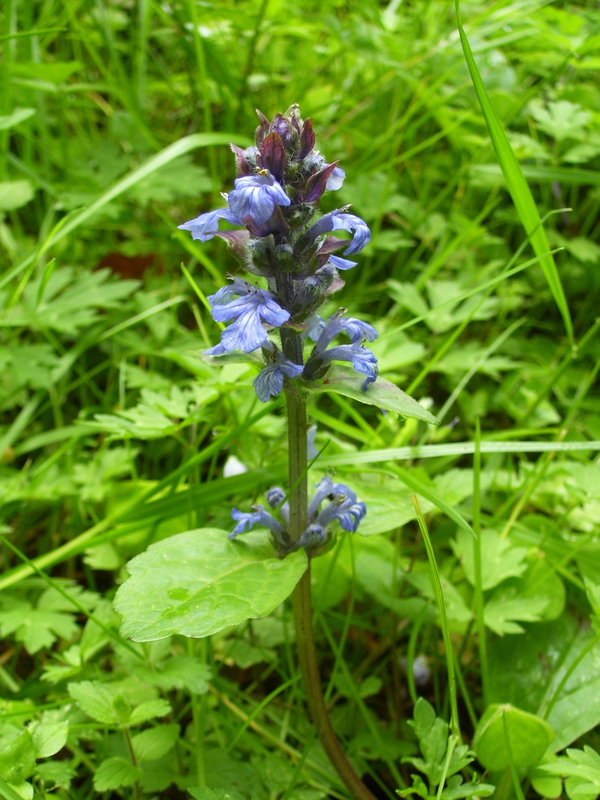 Another common wild flower with faint musical connotations is bugle, which grows profusely in the woods here. Bugle rarely grows more than a hand high, but makes an impression by sheer volume. 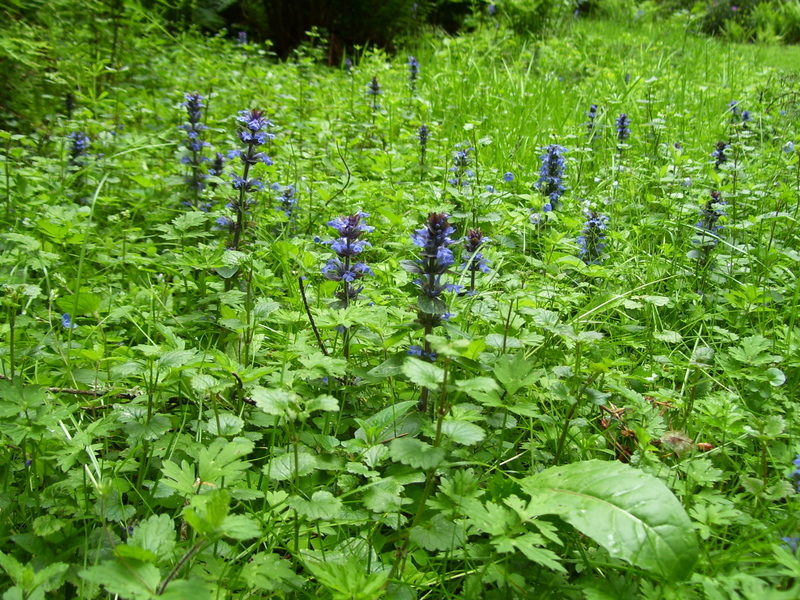 After the bluebells have gone, the bugle remains to spike the grass with its tiny blue trumpets. I usually think of it as a scrappy little thing. Close up, though, it looks rather exotic, like an orchid. 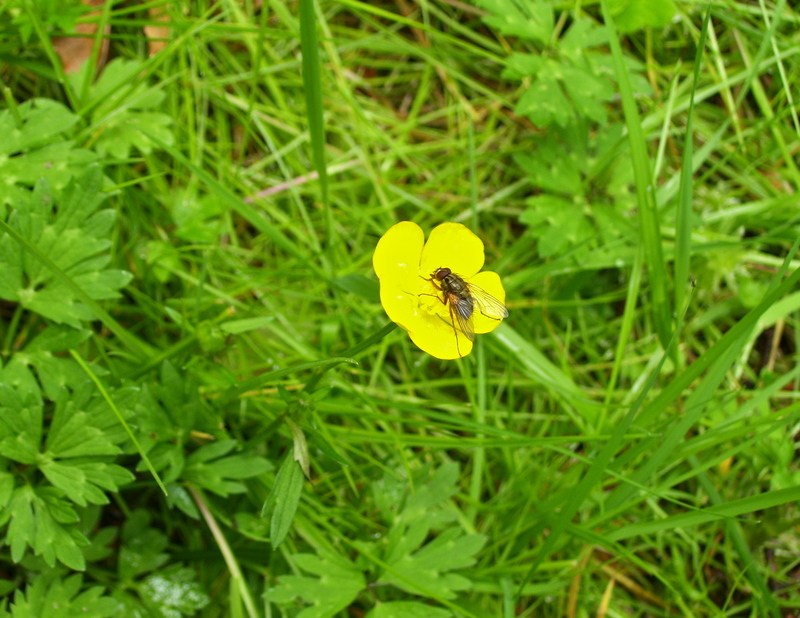 Equally easy to take for granted, but even more widespread, is the humble buttercup. But who could not like a buttercup? Every rural child learns the trick of holding one under a friend’s chin to see if they like butter. (If the yellow reflects a golden glow on your skin, you do.) Insects love them too: here is a fly on one, rubbing his hands with glee. The cattle pasture is absolutely covered with buttercups at the moment. The cows meander through a golden haze, like a scene from a Thomas Hardy novel. In amongst the yellow is mixed the sky blue of speedwell, a tiny flower, each bloom smaller than a fingernail but one of my favourite so-called weeds. 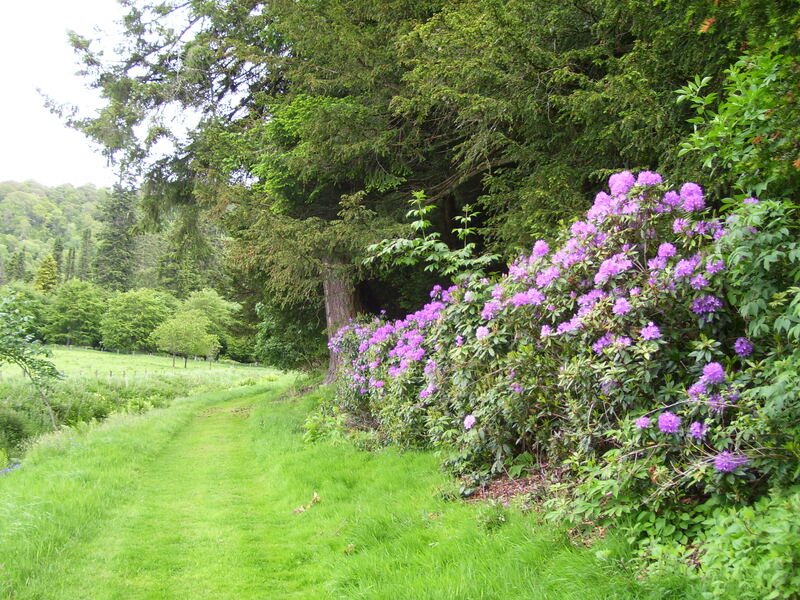 Finally, although they are not strictly wild at all, I must mention the rhododendrons. No visitor to Scotland at this time of year could fail to notice them. 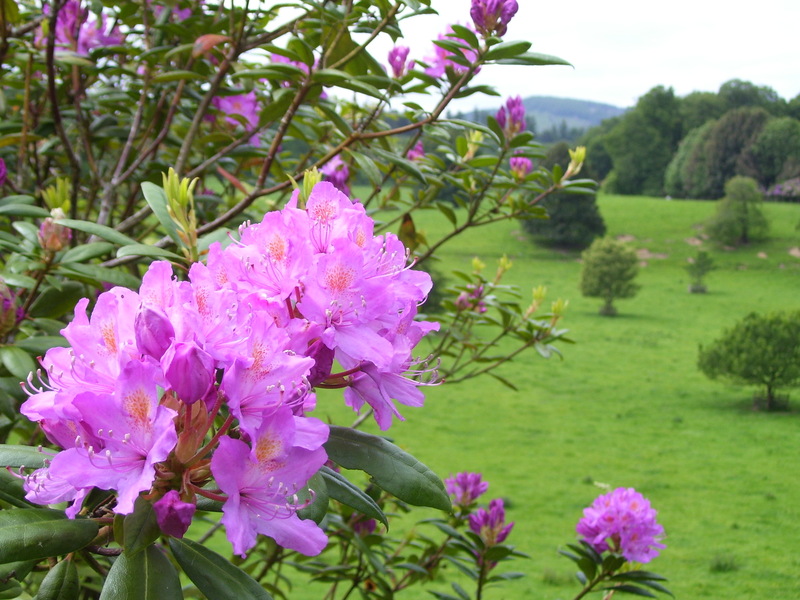 Rhododendron ponticum is considered a nuisance by many gardeners. Highly invasive, it has become naturalised in many parts of Scotland. A mass of pinkish-purple rhodies is a fairly sure clue that there is, or was, a big house or landed estate in the area, as rhododendrons were planted as fashionable ground cover in many such properties in the nineteenth century. Castle Beastie is a case in point: every drive, ride and wood is bordered by ponticums. Their rampant growth chokes out other species of plants, creating a virtual monoculture where they are left unchecked. For me, however, despite their drawbacks, they are part of the early summer picture, and I welcome their streaks of colour in the lush green landscape. These few examples are only a taste of the more common wild flowers here. I hope they give some impression, though, of what there is to enjoy on our daily walks in this cold, wet, sunny, stormy, blooming June. From last year, you might enjoy: Midsummer’s treasures. You are so right about fashion. The kilt is much more flattering to the average man than white tights and a ruff, which makes me think of Blackadder’s comment about ‘a bird who’s swallowed a plate’. I’m amazed that you still have Bluebells in June. I do like the look of the Rhodies but it is a shame that they stop other things from growing. Posting these pictures did make me realise that we have had bluebells flowering since late April. There are still lots of them in full flower, not in the woods (where they are already turning to seed) but along the margins of the woodland. Gorgeous photos as always and what a landscape you enjoy. 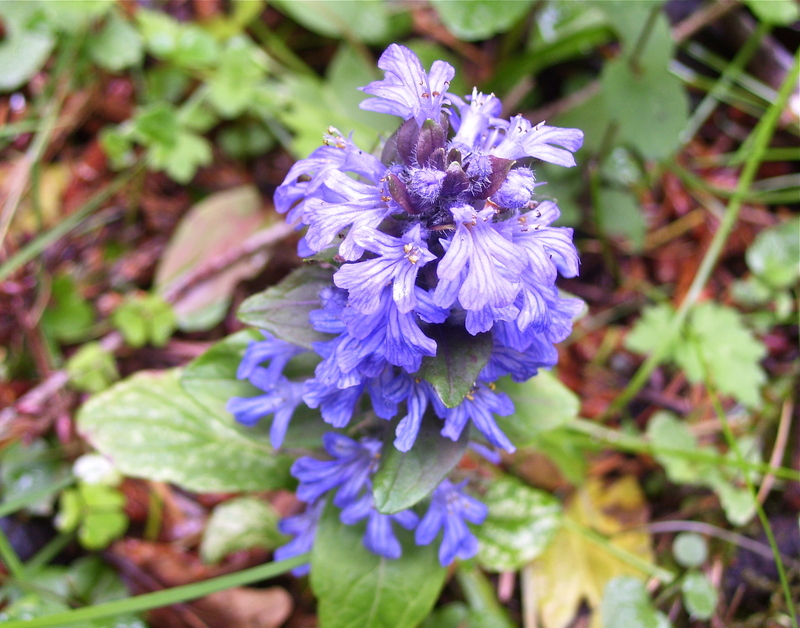 We still have bluebells in the hedgerows here in Mid-Wales and all the other wild flowers in your photos. I too love speedwell, as well as periwinkle and forget-me-nots – all the tiny, blue flowers. 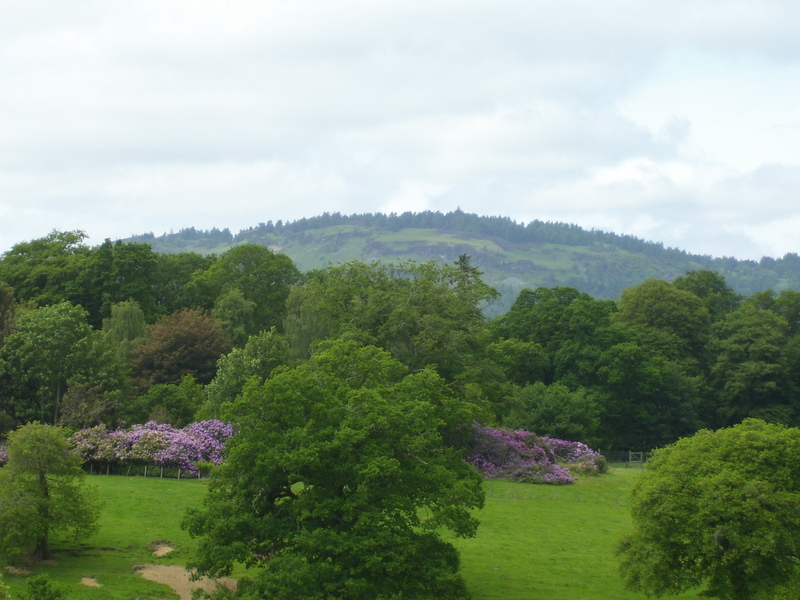 Forgot to mention that Mid and North Wales also have a major rhododendron problem for the reasons you give – but don’t they look wonderful at this time of year. Wales has so much in common with Scotland, it seems! We must have similar mildly acidic soil, I guess. I love all those tiny blue flowers you mention. The little wild forget-me-nots never fail to charm. Rhoddies in flower here too, I just posted a pic of them from my latest bike ride. Plenty of old estate ‘policies’ in your part of the world too, I think! And all those big Victorian houses of the industrialists made good. I used to love climbing in rhodie bushes as a small child – they were just the right size for my wee legs. You can’t help but smile and feel happy at the sight of a large patch of buttercups and speedwell, it’s such a simple but lovely combination. Isn’t it just lovely? I think that’s my favourite picture of this lot. It makes me want to run outside and see them again. 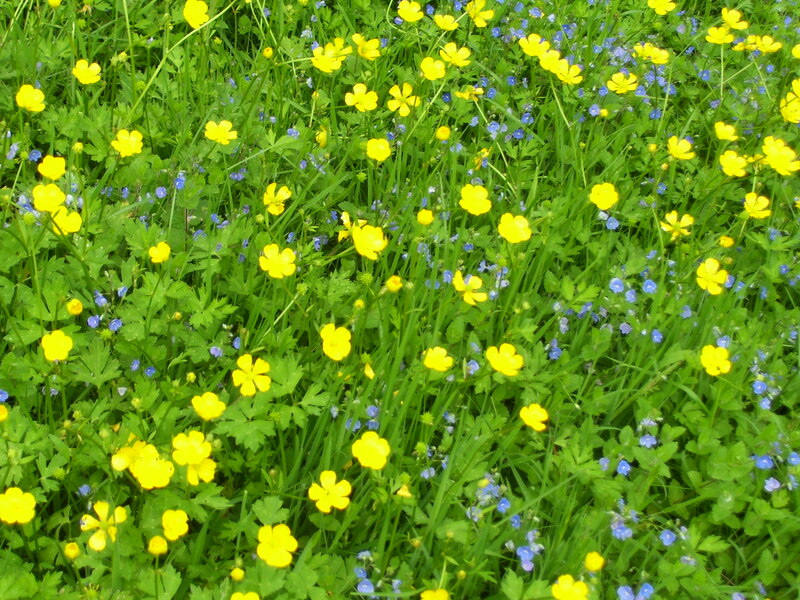 The buttercups with the blue between them are so evenly spread it could be a fabric design!